If you have set up a collection of networked microcontrollers – for example in a home automation project and/or with a selection of sensors, one annoyance is needing to run an ethernet cable to each microcontroller AND locate the microcontroller close to a power point to give it power. However for low power projects, there is an alternative – Power over Ethernet (PoE). 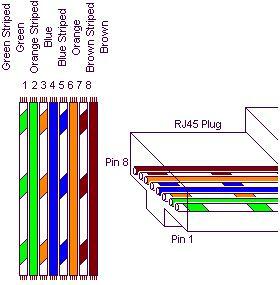 Pins 4/5 (blue pair – blue and blue/white) and 7/8 (brown pair – brown and brown/white) are the wires not used in 10/100 Mbps networks which can therefore be used to carry power. Pictured below is the old school DIY method of getting power through ethernet cables. You cut through the insulation of the cable at each end before the RJ45 plug and identify, cut, and extract the blue and brown twisted pairs. 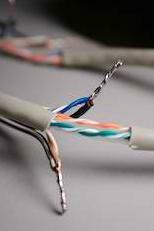 The ends of the blue pair are then soldered together, and the ends of the brown pair are soldered together at each end of the cable. You can then connect the positive and negative of your low voltage power supply to the twisted pairs at the router/switch end of the cable, and the positive and negative input of the device to be powered to the corresponding coloured pairs at the other end of the cable – i.e. power supply positive to blue pair, blue pair to positive input of device; power supply negative to brown pair, brown pair to negative input of device. All this cutting and splicing is messy and it is easy to nick a cable and/or short something out. Fortunately there is now an option available which makes PoE much simpler – the Power over Ethernet Splitter (aka PoE injector and extractor kit) such as the one pictured below. The kit comprises two pieces. The first is the power over ethernet injector, and the second the power over ethernet extractor. The injector has an RJ45 plug which you connect to your hub/router/switch, and a 2.1mm DC power in socket which you connect to your power supply. The extractor has an RJ45 plug which you connect to the ethernet port on your network connected device, and a 2.1mm DC power out jack which you connect to the device to supply it with power. Both the injector and the extractor have an ethernet port, and you simply connect those together using an ethernet patch cable long enough that you can locate the device where you want it to go (up to 30 metres away depending on voltage and current to be carried). If you have multiple distributed devices to power, this Power over Ethernet set up means you can have one high quality very efficient power supply sending power to all devices through their ethernet cables. The larger Arduino microcontroller boards for example have a 2.1mm power in socket which can be used directly with the typical injector/extractor kit. Other devices may have alternative power connectors (screw in terminals, mini USB etc), but you can always solder leads to the positive and negative power input of the device and attach a 2.1mm socket to those leads to give a nice tidy installation. At the power supply end you need to take the power supply output and connect it across multiple 2.1mm DC power jacks to distribute the power around your set up. Cat 5 ethernet cable is made from 24 AWG wires, so the method described above can be used to supply up to around 300-500mA (depending on what you read) at 5, 9, or 12V etc. This is enough current to power a headless Raspberry Pi (without keyboard, monitor, and mouse etc attached), Arduino, or similar together with sensors and/or a relay or two to control larger devices. Sending 5V over long distances (more than a few metres) will result in excessive voltage drop. 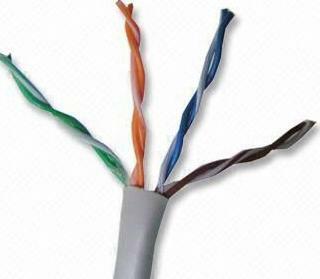 The 24 AWG cable in Cat 5 cable has a resistance of around 84 milliOhms per metre. We use two 24 AWG cores for the positive and two for the negative power supply, so that gives us 42 milliOhms per metre for the positive and for the negative line, so a total resistance of 84 milliOhms per metre of ethernet cable from power supply to the device being powered. If we were to attempt to supply 500mA @ 5V to a device 10 metres away from the power supply over our ethernet cable, there would be a voltage drop of 10 * 0.5 * 0.084 = 0.42V. So our device would only see 4.58V. Therefore to power a voltage sensitive device such as a Raspberry Pi, you would have to distribute 12V (or 24V/48V) through the ethernet cable, and then use a small switching regulator or DC-DC converter to get the required regulated fixed 5.0V at the Pi end of the cable. An Arduino can be powered safely from 12VDC directly as it has its own on board voltage regulator, and even if there is some voltage drop the voltage arriving will still far exceed the 7V recommended minimum. Note that there are power over ethernet devices available which send 48V through the ethernet cables – higher voltage therefore lower current and lower line losses – and so much more power can be made available at the output end. Click for more information here: Power over Ethernet 48V injectors. 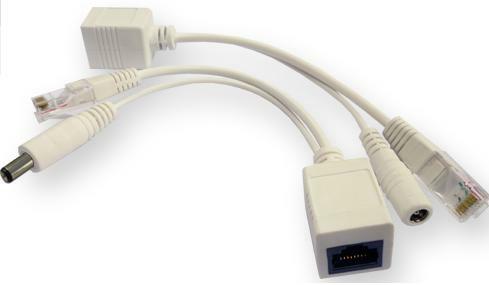 Click here to buy Power over Ethernet Splitters now. Prices start at around £3 per kit delivered.